KIEV, Ukraine -- Ukraine’s united opposition, Yulia Tymoshenko’s Batkivshchina (Fatherland) party and Arseniy Yatseniuk’s Front Zmin (Front for Change), held a congress on May 12 on the symbolic St. Sophia’s Cathedral Square in Kiev. Front for Change party leader, Arseniy Yatseniuk. The congress released a detailed program for the upcoming October parliamentary elections. Boxing champion Vitaliy Klychko’s UDAR (Ukrainian Democratic Alliance for Reforms), which attracts voters from the former Silna Ukrayina (Strong Ukraine) party that merged in March with the Party of Regions, refused to join the united opposition. In an April opinion poll, UDAR and the social democratic “Ukraine – Forward!” party received a combined 12.5 percent of the vote compared to 30 percent for Batkivshchina and Front Zmin. The Party of Regions and Communists have a combined 21 percent, but the authorities plan to build a parliamentary majority coalition by attracting most of the 225 deputies elected in single-member districts. UDAR is contemplating merging with Natalia Korolevska’s “Ukraine – Forward!” party. If this goes ahead, Klichko’s UDAR will be viewed as a “virtual opposition” much like Korolevska, who defected from Batkivshchina and is rumored to be funded by the Party of Regions. Klichko and Korolevska are both from the Donbas area in eastern Ukraine. The united Batkivshchina-Front Zmin opposition presented what may be considered a highly radical political program. It states, “They [the Yanukovych camp] believe they have come to power forever and that Ukraine will always be that which it is now”. Deputy Prime Minister Serhiy Tihipko already believes he knows the results of the October 2012 elections and that the Party of Regions will come first with 30 percent of the vote. 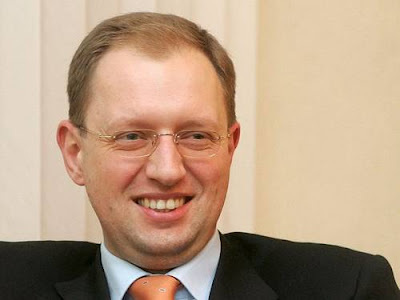 Yatseniuk has adopted Tymoshenko’s rhetoric of the need to remove the “criminal occupation of Ukraine…”. “The entire state machine – courts, prosecutors, militia – are placed at the service of a few families and clans. Their aim is to ensure the authorities are not replaced or that an untold transfer of national wealth is not sent to offshore zones and foreign accounts”. • An “anti-corruption lustration” whereby state officials’ expenses and property values are compared with their tax declarations. If there is a discrepancy, the officials will be criminally charged and banned from public office. If this were to be implemented, Yanukovych would be criminally charged – although he has been a state official since the 1990s, he lives in one of the biggest private palaces (Mezhyhirya) in Ukraine. Oleksandr Yanukovych – who has amassed a fortune since his father was elected president and, in 2011, entered the top 100 list of wealthiest Ukrainians – would also be liable to prosecution for pursuing business interests and corporate raiding while serving as a parliamentary deputy. • Law enforcement involved in political repression will be prosecuted. This would directly affect many loyalists around Yanukovych from Donetsk who have been given key positions in the security forces. • What has been “stolen” through corrupt tenders and insider privatizations will be returned to the state budget. This will directly affect oligarchs such as Rinat Akhemtov who have expanded their business empires since 2010 through preferential privatizations. • “Piano voting” – pushing vote buttons for other, absent deputies in parliament – especially common in the Party of Regions, many of whose moguls live in the EU, will be punishable. Organizing election fraud will be criminally liable. Nobody was punished for election fraud in the 2004 elections, and Yanukovych continues to believe he won them in the second round. He also believes that the Orange Revolution was a US-backed conspiracy to install the US’s “puppet,” Yushchenko, into power. • An independent judiciary will increase the role of the Supreme Court, which was marginalized in the July 2010 judicial reforms. The Constitutional Court, “which has compromised itself with decisions that were ordered (by the Yanukovych administration),” will be liquidated. The criminal code will be Europeanized and law enforcement will be brought under civil control. The opposition program is vague as to what reforms would be undertaken for the Prosecutor-General’s office and Security Service (SBU), which remain neo-Soviet institutions. Party political programs in Ukraine have traditionally been weak on foreign policy. The 2012 united opposition program does not mention NATO, thus continuing in the tradition of Yushchenko’s 2004 and 2010 platforms and Our Ukraine’s 2002, 2006 and 2007 programs. The Association Agreement and Deep and Comprehensive Free Trade Agreement (DCFTA) are frozen by the EU in response to selective use of justice against the political opposition. EU leaders have stated they will not be unfrozen until Tymoshenko and other political prisoners are released and permitted to participate in politics. The EU’s annual report issued on May 15 reported a further deterioration in democracy and growth of corruption in 2011 in Ukraine. Serhiy Kudelia, a Ukrainian expert, describes the 2012 opposition program as far more radical than that proposed by Viktor Yushchenko in 2004. Eight years on, while Ukraine’s current opposition has a more radical program, the country is more divided; and Tymoshenko and Yuriy Lutsenko, who played major roles in mobilizing the Orange Revolution crowds, are in jail. If the establishment was afraid of Yushchenko coming to power in 2004, Yanukovych and his administration are doubly fearful of being removed from power through elections or a revolution. In a discussion on whether Ukraine awaits a future revolution Kudelia predicts that the 2015 revolution will be accompanied by violence. This is more likely if Yanukovych and the Party of Regions continue to appeal to divisive issues such as making Russian a second state language to mobilize eastern Ukrainian, Russophone voters. Discussion of a new law that would increase the status of Russian led to a bloody riot in parliament on May 24. In addition, the Yanukovych administration’s selective use of justice has crossed a Rubicon that could become a boomerang. The European Parliament issued a strong resolution on May 24 and the US Congress is debating a draft law that would draw up a visa black list for Yanukovych, his administration and the Ukrainian government.